Clayton Crooks is an award winning author, writer and computer consultant. Awesome 3D Game Development: No Programming Required teaches aspiring game developers how to create their own computer games without programming skills and provides an in-depth understanding of how the game design process works. Using hands-on tutorials and “drag-anddrop” game engines, readers learn to make and modify their own interactive 3D computer games, create models, and select game assets. 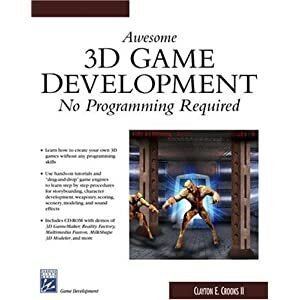 The CD-ROM has most of the demos of the development tools used in the book, including 3D GameMaker, Reality Factory, Multimedia Fusion, MilkShape 3D Modeler, and Paint Shop Pro. This is a great way to learn the fundamentals of game design and game creation no programming skills required! 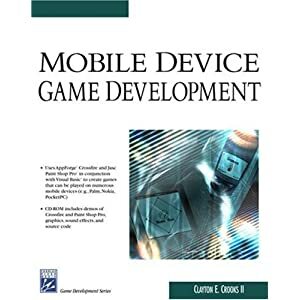 Mobile Device Game Development explores game development tools and practices for the rapidly growing mobile device market. 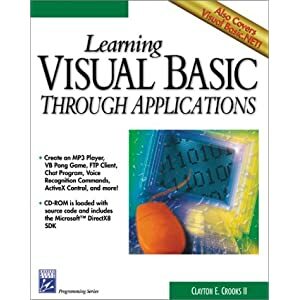 The text uses the AppForge® MobileVB SDK and Paint Shop Pro® in conjunction with Visual Basic® to create games that can be played on numerous mobile game devices (e.g., Palm, Nokia, and PocketPC). The book and companion CD-ROM include tutorials and sample games to provide the reader with hands-on experience in creating games such as slot machines, card games, baseball, children’s games, and more. Also on the CD-ROM are graphics, sound effects, and source code. The book addresses specific content issues that arise when switching from a PC game programming environment to that of a smaller device, such as the creation of graphics for a small screen. * Applications – Appforge Crossfire Trial – An add-on to VB which brings the world of cross-platform mobile device development to VB programmers; Paint Shop Pro 8 Trial – One of the best graphics programs for game developers, great for creating 2D art for for your games. * Figures – The full-color version of all the figures in the book. REALbasic makes it possible to create full-featured Mac OS and Windows applications. This book/CD-ROM package enables you to learn to program in REALbasic by creating applications instead of reading chapter after chapter on programming topics. You’ll focus on developing complete, self-contained projects beginning with an explanation of the concepts and followed by the complete source code. The applications from each chapter can be used immediately, so the rewards of learning are quick and extensive. 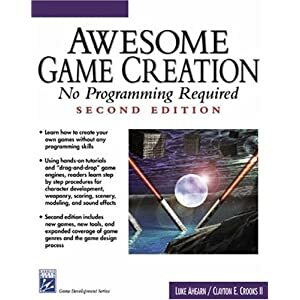 Awesome Game Creation: No Programming Required, Second Edition teaches aspiring game developers how to create their own computer games without programming skills, and provides an in-depth understanding of how the game design process works. Using hands-on tutorials and “drag-and-drop” game engines, readers learn to make and modify their own interactive 2D and 3D computer games, create models, and modify existing games. 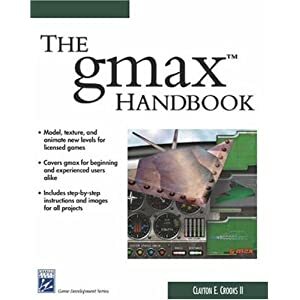 The book uses development tools like The Games Factory, The PIE 3D Game Creation System, gmax, 3D GameMaker, Milkshape 3D, GameMaker, and other cutting-edge software. Limited-use versions or demos of these development tools are located on the accompanying CD-ROM, or may be easily downloaded from Web sites. This is a great way to learn the fundamentals of game design and game creationno programming skills required! Packed with everything you need to make all of the fully interactive games in this book and more! Each of the folders includes useful tools (with the exception of the Microsoft Flight Simulator game) to write the programs that are developed in each chapter. It also includes all of the images (color images where applicable) of all the figures in the book, and the source code and executable files for the sample projects.